Such a gorgeous day to open up the farm box, which included a collection of vegetables perfect for a Summer Minestrone soup. I immediately got them prepped for the pot, dicing a crunchy Maui onion, nipping the ends of crisp green beans, and cubing tender, golden sunburst squash. Ribs of rainbow chard sautéed in the mixture, along with their curly ribbon-cut leaves. In went fennel seeds that I crushed in a mortar, dried oregano and thyme, a can of organic tomatoes and homemade chicken stock. I left it bubbling away on the stove top, making my house smell like a walk through Tuscany. White beans, pasta, a splash of olive oil and a zip of fresh basil will finish it off. As my daughter and her friend blew bubbles and squirted water guns in the backyard, I started preparing Farm Box Meals for a few families. In addition to the summer minestrone, I’ll deliver Grilled Thai Chicken, utilizing a leafy bunch of cilantro, and Asian Red Cabbage, Radish and Peanut Slaw. I’m jazzing up Crunchy Lemon Tilapia with a zingy Radish and Greens Salad Dressed with Brown Butter. I’ll also prepare my favorite Farm Box Veggie Enchiladas with the remaining rainbow chard and the giant Maui onion. As for the picture-perfect blueberries and strawberries, I’ll make breakfast parfaits with yogurt and granola. The Memorial weekend promises good food and lots of fun. Enjoy your family and your farm box! Heat a large stock pot or dutch oven over high heat, then add olive oil. Add the onions, carrots, celery and garlic, and cook until softened, about 10 minutes. Add the 4 cups of summer vegetables, and cook while occasionally stirring, until vegetables start to wilt, about 10 minutes. Add dried herbs, salt and pepper, and cook for another 3 minutes. Add diced tomatoes and stock, stir, and bring to a boil. Reduce to a simmer and cook until vegetables are tender. Add beans and basil cook until heated through. Portion prepared pasta into individual bowls, then add soup. Top with grated cheese and olive oil just before serving. School was out for spring break, and we missed our farm box! 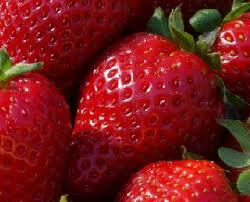 To my surprise, the crops have transitioned into spring, and we had gorgeous Maui onions and juicy strawberries. I’m going to write a separate post about the interesting way the two of those crops go together. 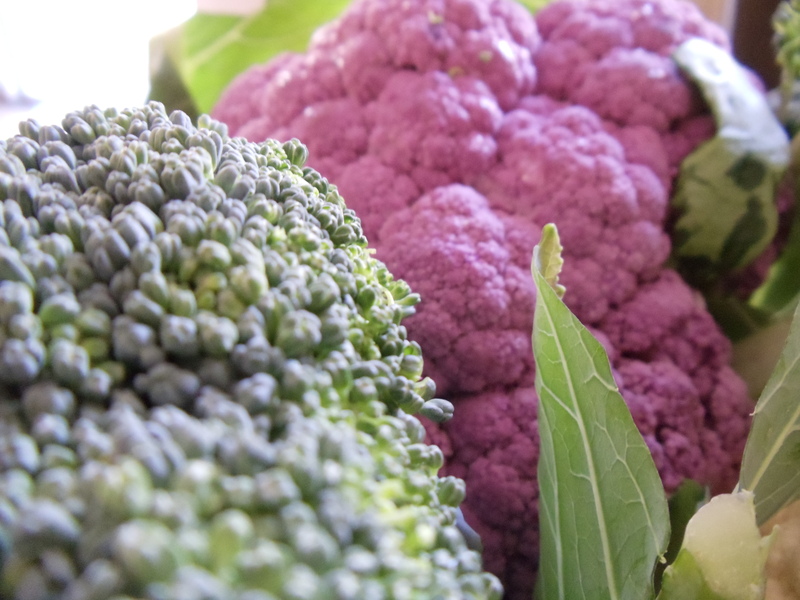 I was also excited about a gorgeous head of purple cauliflower, the stately collard greens, and a head of cabbage that looked like it came from “Little Shop of Horrors.” I’m not sure if I should throw a Baja fish taco party or go on the Cabbage Soup Diet. I cooked four Farm Box Family Meals, which included Red Curry Beef with Broccoli, Snap Peas and (of course), Cabbage, Ceaser Chicken with Red Leaf Lettuce Salad, Vegetable Soup with Italian Chicken Sausage and White Beans, and Farm Box Veggie Enchiladas. Did you know you can order these meals, cooked from your farm box, packaged to reheat and delivered to your door? 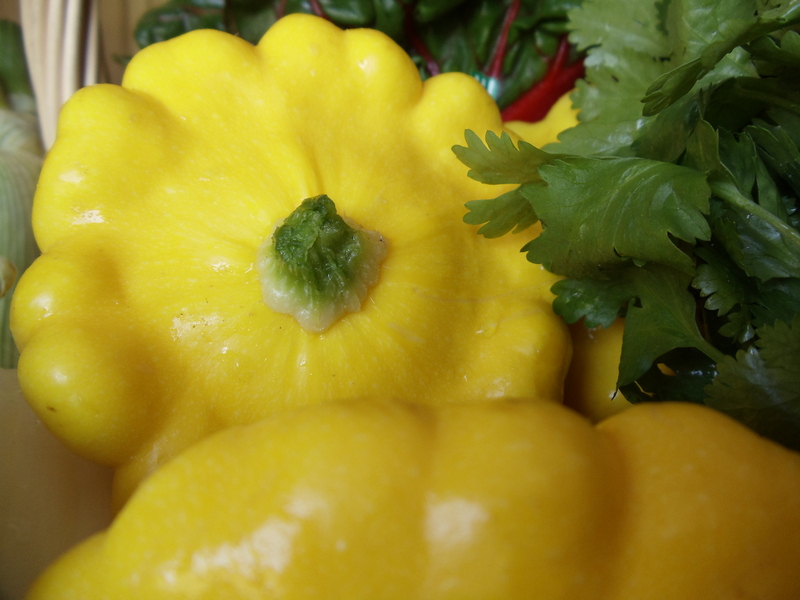 It is a delicious, healthy and economical way to enjoy your farm-fresh produce. Check out my Services page for more information. 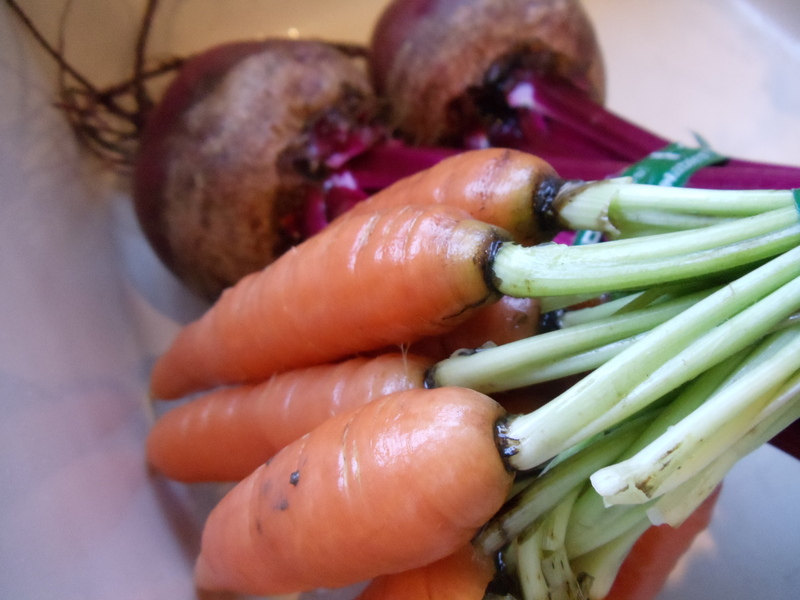 I’ll be posting new recipes by the end of the weekend, for now I’m going to tuck into a bowl of that vegetable soup. Golden beets, sugar snap peas, grapefruits and leeks were some new additions this week, and we also got favorites like tender carrots, spinach, romaine, kale, navel oranges and bok choy. There are some more pretty pink lady apples. As fortune would have it, we have apples left over from our last delivery, so now I have enough to make an apple crumble. There’s another bunch of cilantro, which has an uncertain future. Maybe I’ll see if I can find some nice tomatoes at the farmers market and make a pico de gallo. Getting all of the produce cleaned up felt like bringing my kid home from the beach. There was so much sand to contend with, I threw everything in the salad spinner and triple washed everything. I cut the tops of the leeks off, saved a few of them for upcoming chicken stock. I lopped the beets away from the greens, threw them in a foil packet for roasting, then prepped the greens to put in a wild rice salad where I’ll include leeks, beets, oranges and kale. I practically scrubbed the spinach clean, then stashed it in a bag for later. I’ll make a snack out of those sweet carrots and sugar snap peas with a homemade ranch dip to take to Abalone Cove tomorrow. I’ll also bring a nice green salad for the moms. Before the weekend is over, I’ll have posted my recipe for Apple Crumble, the Wild Rice, Beet and Greens Salad with Maple Orange Dressing and the Homemade Ranch Dip. Have fun cleaning your greens! We had a mix of cold weather harvest and tender spring crops this week, with highlights that included sweet, young strawberries and Japanese white turnips. The farm box was also packed with spinach, carrots, cilantro, red beets, red leaf lettuce, navel oranges, clementines, pink lady apples, kale and broccoli. I was happy to see all of the greens, as I’m looking forward to trying a recipe I found in Food and Wine magazine, Spiced Lentils with Greens. I’ll use the beet and turnip tops, plus the spinach. For the rest of the box, I am planning a Mexican Chicken Soup, utilizing the carrots and cilantro. I steamed the broccoli tonight, which I served with brown rice and teriyaki flank steak. The steak is sliced thin, pan seared it, and cooked it with Trader Joe’s Soyaki sauce, a favorite quick family dinner! 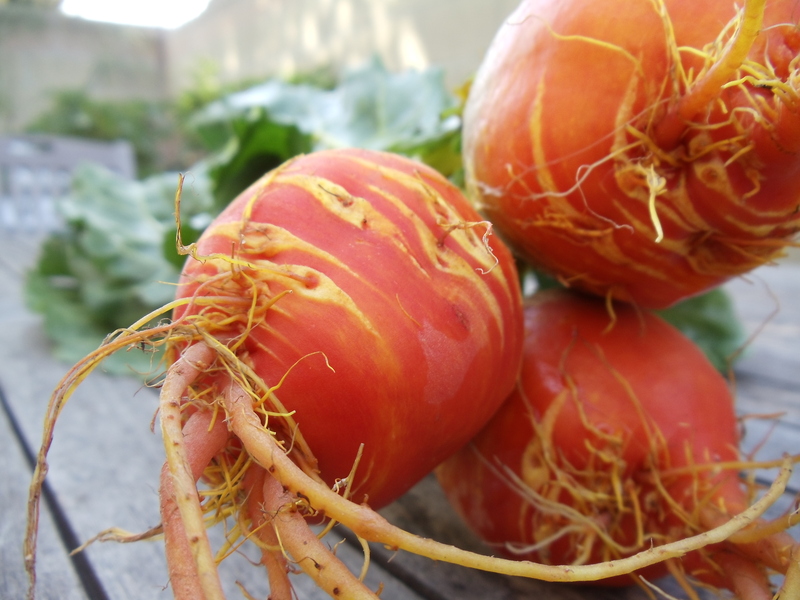 I’ll be pickling the beets and turnips, and putting them in a Red Leaf Lettuce, Clementine and Edamame Salad with Rice Wine Pickled Beets and Japanese White Turnips, it will be tossed with an Asian-style, gingery dressing,. I have fixings, and plenty of kale, to make another batch of Portuguese Green Soup, which I constantly play with; I’ve discovered a new turkey sausage that I love, and I’ll throw in the sweet carrots. I’ll have a few recipes and posts to put up before the weekend is over, and until then, happy farm box day! Today we had some familiar characters in the box, I sorted through them mentally and put them into categories: Strawberries, pink lady apples and cuties (lunch box), broccoli, celery, carrots, spinach, and cilantro (basic stir fry stuff), romaine lettuce and red beets (divine salad), and Romenesco broccoli and kale (wild cards.) This week I’ll be making a Shrimp Stir Fry with Asian Pesto, a Beef and Veggie Pot Pie with some yummy cheddar chive biscuits on top. I’ll serve the pot pie with a Romaine, Roasted Beet and Goat Cheese Salad tossed with my famous Balsamic Vinaigrette. 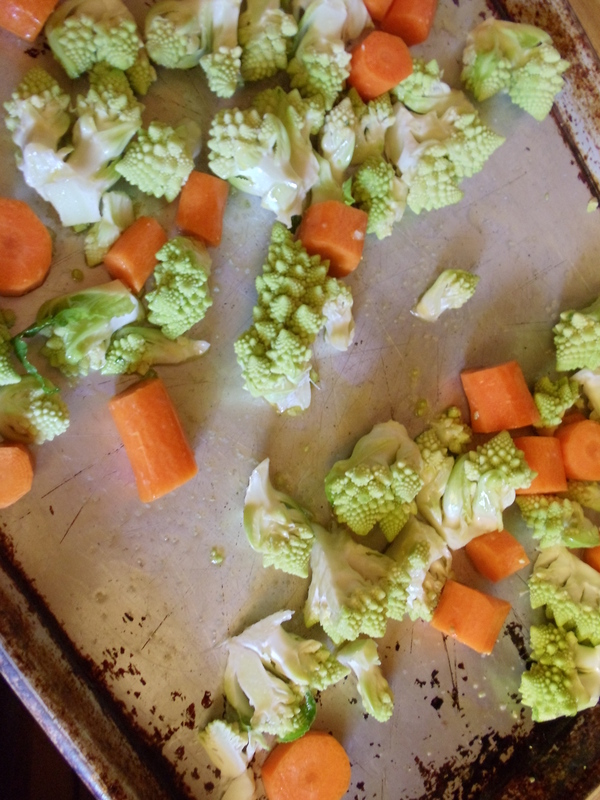 Roasting Romenesco broccoli and carrots for a dip. I have a quart of Homemade Roasted Chicken Stock for soup this week, so I’ll make my Portuguese Green Soup using the gorgeous kale. For the Romensco broccoli, I’ll be repeating a dip I made with it last time it was in the box, in which I roasted it in the oven with carrots and garlic, then processed it with olive oil and feta cheese. I can spread that on Akmak crackers or softly toasted baguette slices. Today’s box had some new treats, like ruby red strawberries and my favorite, Tanaka Farms strawberry jam. We got lovely heads of cauliflower, butter lettuce and broccoli, brilliant bunches of carrots, cilantro and kale, a few russet potatoes, oranges and clementines. My plan is to make a Kale, Linguica Sausage and Potato Soup, a classic called calde verde, or “hot green” in my husband’s country of Brazil. It will be perfect for the cooler weather forcasted for the weekend. I’m looking forward to roasting the carrots and potatoes along with a Simple Roasted Chicken, which will carry us through a few meals, then chicken bones will become stock for an upcoming soup. I’ll roast the Cauliflower with Capers and Red Chile, to serve with day two of roasted chicken. I’ll serve the broccoli simply steamed, along with my daughter’s favorite panko-crusted tilapia, some brown rice, and as strange as it may sound, Japanese mayo to dip them all in. She loves the stuff like some other kids like ketchup. At this point, I have a ton of oranges and tangerines from the last two deliveries that I want to purpose beyond the lunchbox. First, I’m going to use the zest from the skins to make a Citrus Herb Butter that I can freeze and use later, then I’m going to juice them to make a Tangerine Granita, an easy fruit and simple syrup ice. Along with all of the cooking I plan to do this weekend, I can’t wait to get a few of these recipes up on the blog. 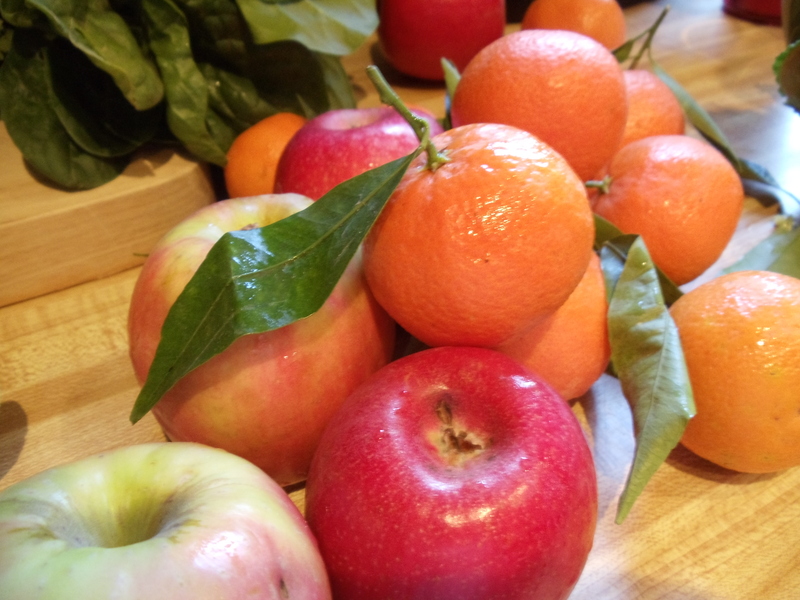 Hope you are all enjoying your farm-fresh produce and a super Superbowl weekend. It’s our farm box delivery day, chock-full of emerald-green spinach, funky kohlrabi, the always welcome carrot and kale bundles, crunchy bok choy, “wildfire” salad mix, cilantro, sweet and crisp fuji apples, satsuma tangerines, navel oranges, broccoli and gem-like golden beets. I decided to tear into the spinach right away, and make something quick and satisfying for lunch. I whipped up a ten-minute Spinach Stracciatella Soup. I’ve been craving really clean foods since the excess of the holidays, and this soup delivered with depth of flavor, nourishment and simplicity. Kohlrabi, Apple and Potato Mash with Seared Pork Tenderloin This is a dish I’ve made a few times when kolhrabi showed up, and it was a hit with my family, especially my daughter, who liked the sweetness of the mash. Sauteed Kale with Kolhrabi, Citrus and Pistachios On the Tanaka Farms Facebook page, I followed a thread about kohlrabi, and one fan raved about a recipe that she had found on Epicurious.com, with sauteed kale, shaved raw kolhrabi, lots of citrus and pistachios.I think I’ll grate the raw golden beets in this as well, and make it my lunch tomorrow. Bok Choy, Broccoli and Beef Stir Fry I’ll get a skirt steak and either do a soy-based or red curry sauce, then serve it with black rice. For the salad greens, I’ll use the navel oranges, sliced fujis and some kind of dried fruit, cheese and nut to accompany my weekly roasted chicken. Another tip: Hold on to the bones of the roasted chicken after you’ve carved the meat. Maybe even freeze them. I will post later on how you can turn it into easy and delicious stock that will transform your soup. My daughter, in fact, has claimed the carrots for her favorite chicken soup, made with this stock. 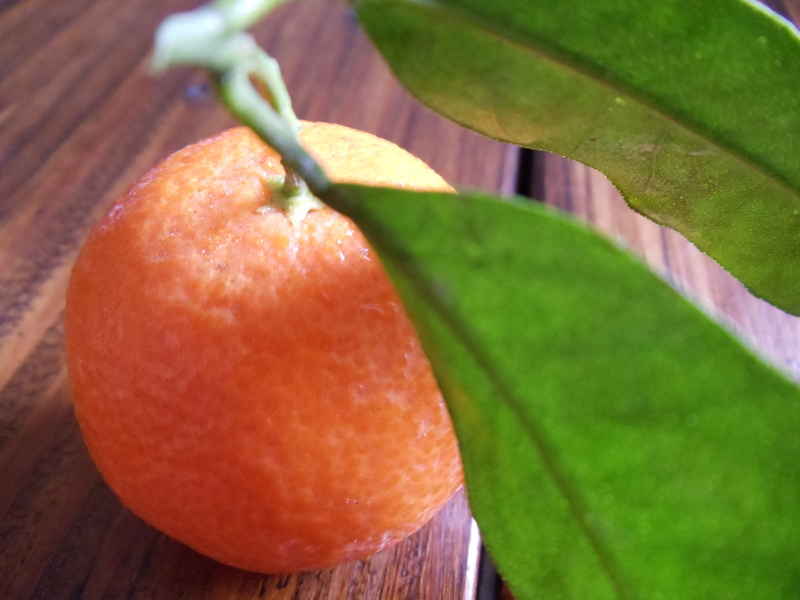 She also hoarded the tangerines for her school lunch box. That zips up our farm box, neat and tidy! I’ll be adding recipes to the blog before the weekend, hope you come back to check them out!